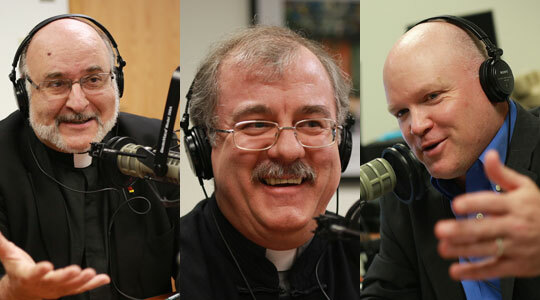 Summary of today’s show: The Xaverian Missionary Fathers serve Christ in the missions in African and Asia, as well as at the Fatima Shrine in Holliston in the Archdiocese of Boston. Scot Landry and Fr. Chris O’Connor talk with Fr. Rocco Puopolo and Fr. Joseph Matteucig about their service in the Xaverian Missionaries in both Sierra Leone and Taiwan, as well as the initiatives they are undertaking in this country to connect American youth with their counterparts elsewhere. 1st segment: Scot and Fr. Chris talked about the celebrations at the end of seminary year. The seminary years ends on May 18. They had a deacons night the other night in which they salute, toast, and roast the deacon class who is going to be ordained. There are 13 resident and 3 or 4 religious community seminarians, about 17 total. They had Fr. Jason Jalbert of the Manchester diocese came to give a talk about priesthood. Scot pointed out that the 17 are from 4 dioceses and several religious orders. Fr. Chris said the two happiest days in the seminary are opening day and ordination day. The other celebration at the seminary was for Bishop Arthur Kennedy who is ending his service as rector at St. John Seminary. Fr. Chris said they commemorated Bishop Kennedy’s distinguished service. 2nd segment: Scot and Fr. Chris welcome Fr. Joe and Fr. Rocco from the Xaverian Missionary community. Scot said there are 45 men’s religious communities in the Archdiocese and those in the metro west region are probably familiar with them. Fr. Rocco said they were found in 1895 by a young diocesan priest in Parma, Italy. He was unable to be a missionary and later became a bishop and archbishop. He founded the order under the patronage of St. Francis Xavier. He noted they are not related to the Xaverian Brothers order that runs Xaverian high school in Westwood. The Xaverians came to Holliston in 1947 after the war. His mother and grandmother assisted with the community from those early days. He became a Xaverian in order to become a missionary in Asia. He was ordained in 1977 at St. Catherine of Siena in Norwood and was sent to Africa. Fr. Joe said he is from northern Italy in the town of Udina, near what used to be Yugoslavia. He entered the Xaverians in Italy and was sent to Chicago for seminary. There was a Xaverian community just a short ride from his home in Italy. He entered while he was still in high school because he felt a strong attract not the community. Fr. Chris asked about St. Francis Xavier. Fr. Joe said he could be described with zeal, a passion for Christ, and enthused, because he wanted to share the Gospel with everyone. Francis did not start as a saint, but loved to fight and party, but when he encountered St. Ignatius of Loyola, he left his old ways and became one of the first Jesuits. Francis Died before getting to China and so the founder of the Xaverian Missionaries wanted them to complete his mission to China. The founder is St. Guido Conforti. He was born in 1865 and died in 1931. As a seminarian, he conceived of the seminary. He started the community as a vice-rector of the seminary. He sent out the first seminaries in 1899. In 1901, he became Archbishop of Ravenna, but he was only there a few years when he got very ill. He went back to Parma to die, but regained his health. He became coadjutor of Parma and then bishop until he died. He made one trip to visit his missionaries in China in 1928 and died in 1931. Fr. Joe said Guido wasn’t well known in northern Italy until recently. Fr. Chris noted he was just made a saint last October. Fr. Joe said what made him special was that he said the Xaverian Missionaries have the gift of living faith which challenges him to see God, seek God, and love God in all. Also, Guido had a dream to make the whole world one single family and we as Jesus’ disciples have to fulfill that dream. He also wanted them to be religious and missionaries. Other missionary orders do not take religious vows. They take four vows: poverty, chastity, obedience, and the missions. Fr. Rocco said he was a pastor of souls locally and a missionary globally. He was committed to helping save souls worldwide. Scot asked Fr. Rocco about the Holliston shrine. Fr. Rocco said the property used to have a high school seminary on it. Since they didn’t have parishes in this region, they wanted property to help people know they were here, It’s a Fatima shrine, because the message of Fatima is a missionary message. Scot said it’s a good visit for families with young kids. They have an outdoor rosary made of large boulders and chains. Fr. Rocco said they had an African night at their hall this past week. People came to hear the head of the Africa Social Justice Network come talk about the Africa synod that took place in Rome a few years ago. Different ethnic communities hold pilgrimages to the shrine. Fr. Chris noted the grounds are lit up with Christmas lights each December. Fr. Joe said people like to come because it’s a quiet place to pray. Fr. Joe said one of the things that attracts children is that the boulders of rosary have prayers in different languages of the world. They are soon going to start a regular outdoor language and will invite people to come forward and pray the Hail Mary in their own language. Fr. Chris asked what formation of men for the missions is like. Fr. Rocco said they hope the men can deal with diversity in a comfortable way. Working and living overseas can be uncomfortable. In formation he would often send the men to work in parish in ethnic communities very different from their own. They help them to be open and comfortable with people of different faiths, to witness to Christ and to listen to the gifts of the spirit found in people throughout the world. 3rd segment: This week’s benefactor card raffle winner is Shirley Bramante from Middleboro. She wins the CD, “The Apostle of the Rosary: Servant of God Fr. Patrick Peyton” and the booklet “The Secret of Mary” by St. Louis de Montfort. 4th segment: Scot said Fr. Rocco served many years in Sierra Leone, Africa. Fr. Rocco said he went there as part of his graduate studies. It was a last minute switch from Indonesia. He went back to the States and right after ordination went back for six years. He did some mission work in the remote northern area of Sierra Leone. It is in West Africa near Liberia, about the size of North Caroline. It gained independence in 1961. The “blood diamond” trade has resulted in the exploitations of many people. He eventually became superintendent of schools. He came back in 1984 for 10 years and then went back, this time in the middle of a war. Charles Taylor of Liberia was trying to annex a portion of Sierra Leone that was rich in diamonds. For 10 years, Liberian-backed insurgents wreaked havoc in the country. Fr. Rocco became a staff member of the bishops’ conference that covered Sierra Leone, Liberia, and Gambia. He did a lot of work in conflict resolution and was also a national youth minister. Scot noted Fr. Rocco was shot in the course of his missionary work. He had been working with youth to empower them to reach out on a peer level. Many of these youths were being enticed into the ranks of the soldiers. As their pastoral center was being looted one day in 1988, Fr. Rocco engaged a conversation with one of these children looters. He went away and came back drunk, demanding money and other goods. He shot near him without trying to hit Fr. Rocco, but did hit him in the thigh. The 100 kids were later rounded up by the army and they were all shot. Scot asked what percentage of Sierra Leone is Catholic. Fr. Rocco said the number of Catholics has increased because the Church staged during the dark days of the world. At the time, 10 percent were Christian, half of them Catholic. About 30% Muslim, and the rest animists. Fr. Chris asked about the culture. Fr. Rocco said there is no privacy. It is important to greet everyone or risk offending them. He said he couldn’t walk between the high school and the church without it taking three times as long as it should. Fr. Joe’s primary service overseas was in Taiwan. Fr. Joe said he spent 13 years in Taiwan. He learned the language and culture in three years and had active ministry for 10 years. He said you need a musical ear and a good memory to learn the language. He gave examples of how difficult it would be. He did find that when he arrived in the country he felt at home. His teachers were very understanding and solicitous almost too a fault. They were always very positive and affirming. For three years they studied Chinese for three hours per day, then the bishop of Taipei asked him to be part of the diocesan youth office. Ninety-five percent of high school and college students coming to diocesan youth programs were non-Catholic. They felt attracted to the values of the Gospel. The goal was to show that God created them for something special. The Chinese culture emphasizes taking care of yourself and working hard. He found the youth to be extremely generous with time and talents. The students would be in school from 7:30 am to 4:30pm. Then from 5:30pm to 9:30pm they go to remedial school to review the topics of the day. They are preparing for then end of high school exams which were a lot of pressure. So they do their homework until midnight and get up at 5 or 6 pm. Yet, when there were programs, they were always willing to come out. Fr. Chris asked if the government was supportive. Fr. Joe said it was much like in the US, where you could do anything that’s allowable within the law. That contrasts with China where you have to be much more attentive. In mainland China, they work mostly with disabled children and adults. He said about 60 million people have disabilities in China. Fr. Rocco said a high percentage of people in the developing world are under the age of 15. In the majority of countries they work in, the majority of people are young people. He said there are about 800 Xaverian Missionaries. They have about 80 men in formation. Fr. Chris about the Taiwanese culture. Fr. Joe said the Chinese are very curious. People have no compunction about looking into places that we would see as private, or asking questions, but you learn that it is a kindness because they want to know you better in order to serve you better or give you a better gifts. They are also very superstitious, especially about numbers. They are also very generous. Scot said they have a program in Holliston called Global Youth Mission. Fr. Rocco said for the past 10 or 15 years they have been looking at ways to reach out to young people. The order initiated the outreach to empower youth to be active in the Church, to help them link with young people overseas. They are also working with the Office of Cultural Diversity to connect with youth immigrants from Africa and Asia to help them connect with the Church locally. Fr. Rocco said they have information on their general website and still working on a specific website for the initiative.